To be a fly on the wall in a pawn shop would be a fascinating thing! The items that have came through our store over the years have been nothing short of interesting. From signed Michael Jordan jerseys, a diamond about the size of a dime, to historical memorabilia that has been on earth dating back as far as the 1700‘s.. leaving it very difficult to narrow down our favorites! We decided to share these top items with you guys by starting a mini series. Each week, a different employee will share their all time favorite item that has came through our store! We hope you guys enjoy!! My first would be the 5 carat cushion cut diamond! It was absolutely GORGEOUS! We were told it was worth around $100k! Funny back story on this: We were told by a local jewelry shop that we wouldn’t get more than $30k for the diamond. Luckily for us, we didn’t take the first bite. We ended up getting more than two times what was offered and just in time to make a payment towards the hefty $140k tax bill on our store. 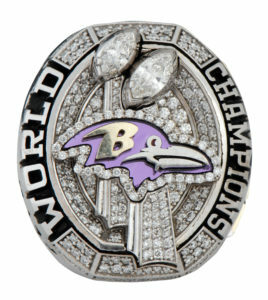 My second is the 2012 Baltimore Ravens Super Bowl Ring. It actually went to auction and sold for $36,000! This 10k white gold super bowl ring had 243 round-cut diamonds, two marquise diamonds that stood as the top of the Lombardi Trophies, and purple and gold enameling for accents. It was extremely heavy – weighing around 85 grams and took up quite a bit of room on my tiny finger. We were all pretty awe struck looking at this ring! It truly is hard to narrow down the cool items. It’s not an every day occurrence, but when something unique comes in, we get pretty excited. You never know what part of history will walk through the door next! This entry was posted in Top 3 Coolest Items by each employee and tagged baltimore ravens, barboursville wv, classic jewelry and loan, coolest pawn, diamond, history, huntington, pawn, pawn shop, superbowl ring, top 3, wv. Bookmark the permalink. Just think, if your items could talk, what stories they’d tell!